Martin Mc Donnell is a 17 year old singer-songwriter from Dublin with a superb voice. 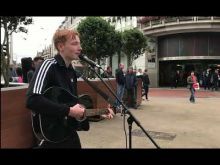 He started busking on Grafton street in July 2018 and was a finalist in the Busker Fleadh in September 2018. His Latest song “Words I cannot find” has reached No.1 on Balcony TV. He has busked several times at The Bluebell Brocante where he quickly became a favourite among stallholders and public alike. He is currently working hard writing and busking most weekends (and studying for his leaving cert...) while saving for his first EP which he hopes to have early 2020.